2-32-2c: Clarified when a base runner can slide through home plate in a straight line. 3-2-2 PEN: Clarified when a coach-assisted runner is declared out. 3-3-1 PEN: Developed a three-step process when administering disciplinary action to a player(s) or coach(es) for inappropriate behavior on the bench and in the field. 6-2-6: Clarified that the pitching restriction is based on number of pitches thrown. 8-3-6: Clarified when an umpire hinders the actions of the catcher in a defensive attempt and how baserunning awards are administered. 8-4-2s: A companion rule to support the above-mentioned 3-2-2 PEN modification regarding coaches’ and players’ conduct. Beginning with the 2015 high school baseball season, teams will be allowed to use video monitoring or replay equipment for coaching purposes during games. This revision to Rule 3-3-1 was one of five changes recommended by the National Federation of State High School Associations (NFHS) Baseball Rules Committee at its June 8-10 meeting in Indianapolis. The committee’s recommendations were subsequently approved by the NFHS Board of Directors. Previously, video equipment was permitted but it could not be used during games for coaching purposes. It has come to our attention that some schools continue to try and let their catcher’s wear the skull cap and mask combination when behind the plate during a game or in the bullpen while warming up pitchers. THIS IS ILLEGAL IN BOTH SITUATIONS!!!! Rule 1-5-4 states that the catcher’s helmet and mask combination must meet NOCSAE standards just like the batting helmets. At this time there are no skull cap and mask combinations that meet the NOCSAE standards. This means that the only helmet and mask combination a catcher may wear behind the plate or in the bullpen is the hockey style helmet and mask combination. Please make sure this rule is enforced at all times. We have had problems with the rubber sleeves that pitchers are wearing. These sleeves are LEGAL, if they are not white or gray! The pitcher DOES NOT have to have one on each arm. The arms DO NOT have to be uniform! If the pitcher has a sleeve on his right arm, he does not have to have one on his left arm. You do have the option of deeming this look, sleeve on one arm not on the other, as distractive and make him remove it or add one to his other arm. Please explain to the coach why you are making him remove the sleeve. The wind-up stance for the pitcher. Number 1, this is NOT a rule change. The rule has always stated that the pitcher’s non-pivot foot has to be ON or BEHIND a line that extended through the front edge of the rubber. ON the line DOES NOT mean butting up against it, IT HAS TO BE “ON” IT. We have let this situation go over the last few years and it has now become a big problem. 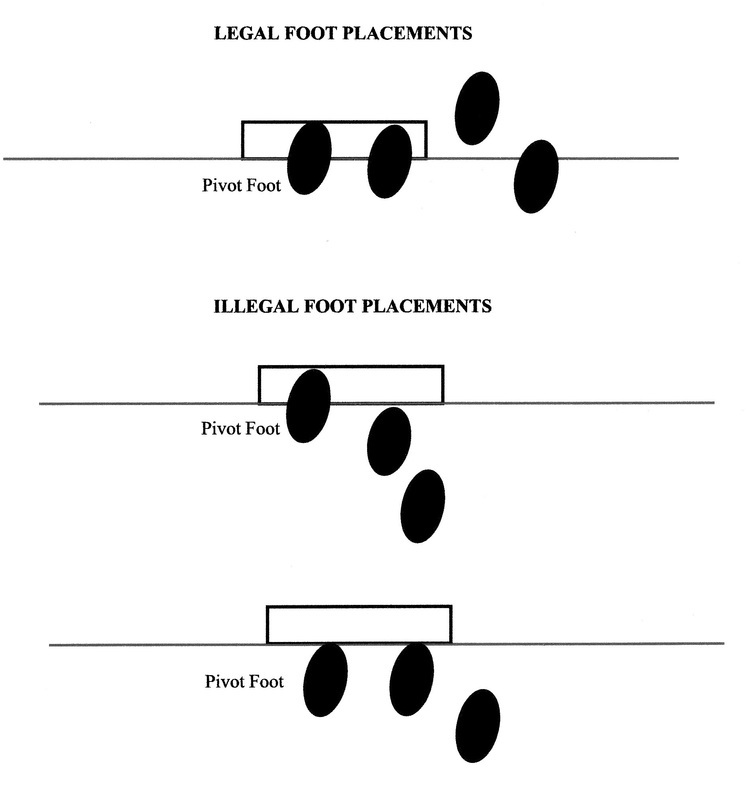 Below are graphics that show the legal and illegal positions of the pivot foot and non-pivot foot. The pivot foot is for a right-handed pitcher. The other graphics are for the non-pivot foot. I would like to cover a couple of subjects that were discussed this last weekend at the State Meeting. The first area concerns a Point of Emphasis in this year’s rule changes. This is a significant Point of Emphasis concerning the pitcher’s stance while in the wind-up position. The pitcher’s NON-pivot foot MUST be on or behind a line extending through the front edge of the pitcher’s plate (6-1-2). We have seen a growing number of pitchers using stances that do not conform to the rule. They are neither in a wind-up or set position. If the pitcher’s NON-pivot foot is in front of a line extending through the pitcher’s plate and he begins his pitching motion, the time-of-the-pitch, this becomes an illegal pitch and play should be stopped. A ball will be awarded the batter, and if a runner is on base, it is a balk. I mention this to all of you mainly due to the fact that I will not be able to impart this information to the coaches on Friday. TASO’s presentation of the rule changes was removed from the program this morning. So, it is going to be up to you to get the message out to the coaches. This should be done either during coaches meetings that many of the chapters have, or during scrimmages before the season starts. It is very important that we get the message across to the players and coaches. We have received a large number of complaints from the coaches about this stance and the problems it is causing. The second item concerns the set position. This past weekend this was brought up during my presentation and I erroneously gave those in attendance the wrong ruling. I sincerely apologize for this false information. The position concerns when a pitcher is on the pitcher’s plate in the set position. Remember the pivot foot must be completely in front of the pitcher’s plate (6-1-3). The stance in question concerns when his NON-pivot foot is outside the edge of the pitcher’s plate, toward 1st base, leaving his shoulder wide open toward 1st base. I was asked if this was legal. That ruling has not changed, it is legal! The problem is that somewhere down the line I was told that when he came set (brought his hands together) with his NON-pivot foot in front of the rubber (what we would deem a normal set position), he could no longer attempt to pick off the runner on 1st. He could now only step off the back of the pitcher’s plate or make a pitch. That part is what was incorrect. He still has the right to attempt a pick off the runner on 1st. Again, I apologize to all those in attendance at the state meeting. Let’s get the message about the correct wind-up stance out to our players and coaches.